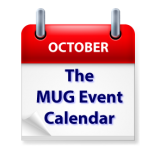 This week on The MUG Event Calendar, the topics are varied and many. Among the more interesting subjects to be addressed are data recovery in Canada, cord cutting in California, data syncing in Florida, and self-publishing in Ohio. Los Angeles Creative Pro Users Group – Director/Editor, Kevin Tent ACE who just directed his first feature, Crash Pad, a movie starring Domhnall Gleeson, Thomas Haden Church and Christina Applegate. It is currently playing on VOD and will be in select theaters Oct 27. Watch it! Rate it! Tent has been nominated for an Academy Award for best editing for The Descendants and won an ACE Eddie award for the same film and received three other ACE Eddie Award nominations for Election, Sideways and About Schmidt.